Two unique AZFlow evaporative cooling applications offer the potential to save significant energy and water. These are cooling the makeup air as an integrated element of the Heating Ventilating and Air Conditioning (HVAC) system in commercial buildings, and as stand alone coolers for industrial, manufacturing, and warehouse facilities. Air conditioning or mechanical chillers are seldom and option for industrial, manufacturing, and warehouse facilities since the footprint of the facilities is typically so large and the associated equipment and costs to cool such large facilities are unmanageable. However, mechanical chillers are an integral part of the HVAC system in most commercial buildings. Cooling the air in facilities in some cities, like Phoenix, is a must in the summer and while less demanding during other periods is close to a requirement year round. While cooling period may be shorter in other cities it always extends beyond the set of design temperatures. As discussed earlier evaporative coolers cool air by evaporating water while mechanical chillers cool this air by using heat exchangers with an intermediate refrigerant cycle. This intermediate refrigerant cycle typically includes a compressor (to compress the low pressure refrigerant vapor in the evaporator coil to a higher pressure vapor), a condenser (where heat is transferred from the high pressure vapor to a wet cooling tower or to the ambient air and the high pressure vapor condenses into a liquid), an expansion valve (where the high pressure liquid is expanded to a low pressure mist), and the evaporation coil (where this low pressure mist absorbs its latent heat of vaporization to become a vapor thereby cooling the coil and the air passed over the coil). Evaporative cooling uses much less energy to cool a facility than mechanical refrigerant systems where and when such cooling is an option. While the energy used per ton of air conditioning is dropping, as the units developed by suppliers become more efficient, it is still significant. Air conditioning units representative of those found today in commercial office buildings in Phoenix use energy at a rate of 0.61 kW per ton (12,000 BTU/hr). About half of the commercial buildings with mechanical chillers use wet cooling towers with additional pumps and fans. AZWall coolers, consisting of multiple wet sections and no blowers, were developed to cool the makeup air to these commercial office buildings. In buildings where this makeup air capability is close to 100 percent, the full building cooling function can be satisfied by these evaporative coolers and the air conditioning chiller, supporting chilled water, and cooling tower systems can be placed in standby. By shutting down the chill water system, circulating water system, and the cooling tower in addition to the mechanical chiller, the evaporative cooling system is able to dramatically reduce the electrical energy demands of the building. One such installation where AZWall coolers have been installed saved enough energy to recover its investment in these coolers in the first two months of their operation. AZFlow coolers are able to generate additional energy savings since they deliver air that is cooler than those of other evaporative coolers thereby decreasing the number of coolers needed to cool the same space under low dew point conditions and make AZFlow coolers the only viable cooler at higher dew point temperatures (Monsoon conditions). AZFlow cooler designs include aerodynamic features to limit drag and fan design features to achieve efficient mechanical design thereby minimizing the fan horsepower requirements. The energy saving driven by these differences can be seen in a retrofit at a local shop where standard aspen pad units delivered 16,000 cfm at 0.25 inches of water static using 7.5 horsepower motors while the AZFlow unit delivers 24,000 cfm at 0.25 inches of water static using a 5 horsepower motor. Seven of these 16,000 cfm Master Cool units were replaced with one AZFlow 24,000 cfm unit. Only four of these Master Cool units were run at one time so the power requirement under this configuration was 30 Hp as compared to the new AZFlow configuration using a 5 Hp motor to drive the fan. The weather profile in much of the west typically means that if evaporative cooling is not effective for the full cooling season it can be effective for a significant period of time such that significant energy savings can be gleaned and the associated benefits captured even if it is not able to provide adequate cooling at the design point. The ability of the AZFlow coolers to stretch this period of coverage brings opportunity for significant savings. The comparative amounts of energy needed to cool both a Phoenix office building and a small Phoenix industrial shop with evaporative coolers relative to that required to cool with mechanical chillers is provided in the table below. This assumes both systems cool the air to the same wet bulb and dry bulb conditions. Additionally, the energy required to circulate the air is assumed to be the same for both systems. The assumed chiller energy use rate is 0.61 kW per ton of air conditioning based on actual existing conditions at a representative Phoenix office building. As shown in the table below the annual cost of energy to cool mechanically assuming 7 ¢ per kilowatt-hr is significant and we all know there is significant upward pressure on the cost for electricity. The peak cooling loads and therefore peak AC related electrical demand typically coincide with the summer peak for the utility electrical grid. 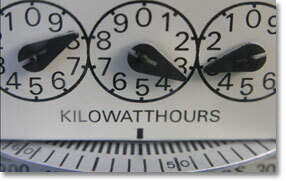 This puts extra benefits on energy savings from both the community stand point and from a business standpoint as it reduces the pressure for construction of additional power stations and avoids the all too frequent challenge facilities seem to face today of being ask to cut back on electric use or shut down their facilities.